We have a nice variety of maps this time, but especially quite a few of multiplayer ones (designed for small groups too!) so gather your friends and try them out. And now, let’s go to the maps! This is a well-designed castle-like map! The map is basically an arena with different levels (or platforms) all around it that you can access through jumping pads and sets of stairs, as well as some small bridges that connect them. The map, as the name indicates, is quite vertical, and maybe having that higher ground might help you. If it works in a fight, it works in Gunscape, right? This map is exactly what the title indicates: an arena with two specific “environments”, an icy one and a desert one. Each area has specific weapons, but both have a good variety. It’d be recommended to explore both anyway, to find the weapons that you like. Both areas are also quite similar in design, with elevated areas and some underground passages, the only difference is the river-like floor on the icy part of the arena. This map might seem to be quite simple, but sometimes less is more and this arena works quite well for FFA! Have you ever wanted to play a team deathmatch map with a few friends, but turns out that the map is too big for just a few people? Well, this map solves that problem! This map is a small arena (seriously, the arena itself is tiny) with a few blocks that can be used as covered, and part of the arena is also divided by glass windows. There’s also a lower level on each side, where you can get your ammo and weapons and you can also invade your enemies side and steal their resources! A short but well designed map! If you’re in a hurry and you wanna play just one more map, then this map is for you. This map is quite packed with action (especially if you leave the respawn at 3), and it has a couple of puzzles, so it’s quite fun, and the best part is that this map looks like the beginning of a campaign, we can’t wait for more! This map is quite different from what we’ve seen, it’s an arena for a 3 people deathmatch game! The arena is medium to small sized, but it has a lot of rooms and hallways where you can hide or maybe surprise your enemy. This map also has a good variety of weapons that you’ll be able to find spread evenly around it, and makes it fair for every player. If you’re enjoying any other map, or if you just finished your own and want to show us, just leave a comment here or on our forum, or drop us a message on any of our social media accounts! Welcome to the 17th edition of our Featured Maps! This time we have a nice variety of maps, and a really good campaign!. Don’t we love it when we get a well designed and long campaign? And this is exactly that! This is a campaign with 12 maps, and right from the bat we can tell you that they’re well designed, not only in terms of progression and how balanced it is, but also how it looks. 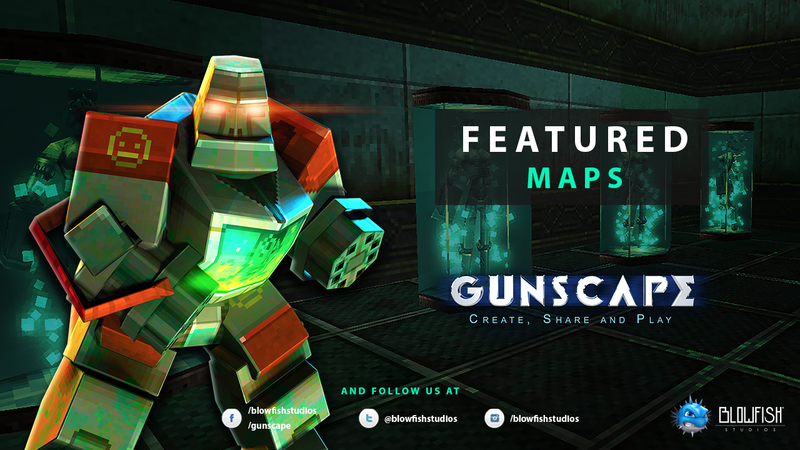 This map uses a lot of our tools to create new things (like “spaceships” made from some blocks and other items) and the general look-and-feel of the map is pretty good. Overall, this is one of those good maps you should definitely play! This map is basically parkour… in space! While this map is not purely a parkour map, it really integrates parkour into the mix very well! You will have to jump from block to block or platform to platform to be able to progress, and to kill some enemies here and there! If you like to jump around, then this will be the map for you. If you like sniper maps, then this map will definitely be with you. WIth just one option of weapon (our 1HKO Gauss Gun), and a sort of arena map with a building on each side, this map will awake the sniper in you. As mentioned, you’ll find two buildings on this map, connected by an arena in the middle, and a couple of bridges between them. This map also has quite a few “windows” or balconies (on different levels) where you can position yourself and try to snipe some people from. This is another classic. This map is composed by a series of small “islands” in the middle of space, and each one with its own theme, like an ice themed one, a forest one, a desert one, etc. All of these islands are connected by a few bridges, and you can also navigate them using the sword (once you find it!). This is another week of mostly co-op maps because we’ve found a few cool soon-to-be campaigns and we can’t wait to see them finished! But don’t worry, for all the FFA lovers, we still have a FFA map. This is a remake of a campaign made by the same creator and inspired by Half Life, and it’s even better than the first time! This campaign has a really interesting story, in fact, the first level is basically context for the rest of the campaign, which helps immersing you in the story. The design is also very good, as the creator paid attention to detail to make it look like an actual Half Life game. There’s also quite a few enemies, and the progression of difficulty increases as you go, so it’s a well balanced campaign too. The description of this campaign is “Wolfenstein + Doom + Quake”, and that is a pretty accurate description! This map is a bit of going back to the basics, and that makes this campaign a classic. Good number of enemies, decent progression and good design overall. If you want a map that allows you to shoot things and you prefer that kind of classic games, then this campaign is for you. If you like “messy” maps, then this map is for you. This map is an arena in the middle of space, with just a few platforms, and mostly just cubes to jump around from and to (you gotta parkour your way through this map). There’s weapons all around the map, so doing a bit of exploration helps, but be careful, because you don’t only have to be aware of your enemies trying to kill you, but also aware of where you’re stepping or you might fall to your doom. This is a short map, but it’s design and story is quite interesting and different. If you like those sort of more “aesthetic” maps, that you might not fully understand at the end, but are still an intriguing journey, then you might like this one! It might be short, as we said, but we like to highlight innovative ideas as well! Welcome to the 15th edition of our Featured Maps! We’ve got a nice balance of co-op and multiplayer maps this time! Let us know if we’ve missed a map that you’ve tried and liked recently! Once again, we start with a classic: you wake up somewhere you don’t really recognise and you find out that there has been a zombie infection! Works in movies, works in Gunscape. What we like the most about this map is that the map itself is a puzzle, or a maze if you might. You will have to go around it a few times to be able to progress, as there’s a few key cards that you need, and they are found all over the map. This map also has quite a bit of action! And enemies that might be waiting for you around the corner, so it’s quite fun! This map is your typical “temple” and sort of adventure map. Here, you’re tasked with finding an old temple, and once you find it, you’ll get a surprise! With quite a few enemies to attack, and most of them hidden around corners or above you, the map might give you a few surprises, but that’s what makes it exciting. It’s a short map too so if you want some quick fun, this one is for you! This map is basically an open tower in a small arena, or we could also say that the arena is the tower! The tower is basically a few levels connected by jump pads and some ladders. Be careful though! There are a few traps spread around the map (in the shape of exposed cables) and if you jump too high or don’t calculare where you jump, you might die from electroshock! Overall, a nice small map, perfect for a bit of parkour and some fun with friends. This map is an homage to the classic Pool Day map from CSGO. Like the original map, it’s a quite small team map that works really well as an arena, so this would be perfect if you only have a small group to play with. The map offers you a huge variety (and amount!) of weapons, and they’re all easy to find so just grab them and fight on the arena. Welcome to the 14th edition of our Featured Maps! This time we mostly have FFA and team maps! We actually found quite a few good maps and we couldn’t include them all this time, but we might next week! We picked this map for it’s look-and-feel and design. This map simulates a sort of frozen valley, situated in the middle of a few mountains, and with a cliff in the middle of it. It reminds us a bit of those winter resorts. The map itself isn’t too big, so you can play it with small and big groups, and it offers many places to hide, places to shoot from and a nice variety of weapons. Overall, this is a nice and fully fleshed map, with a cool design, and you’ll have a lot of fun in it. This is the beginning of a quite interesting campaign! The theme is a classic, a sort of laboratory that had some experiments go wrong, and now you have to be able to escape alive! With a few enemies to fight and a nice design, this map hits all the ticks. The nice twist to this campaign, though, is that you will have to solve a lot of puzzles to be able to progress. There’s a lot of rooms to explore so if you want a map with quite a few puzzles, this one's for you. As the name says, this is an arena that looks like a castle! The main arena is a square in the middle of the map with 3 different levels and an open area in the middle of it. To be able to move through the levels though, you’ll have to go outside and use the different platforms, bridges and halls that connect the whole map. As in any castle, you might get a bit lost, but the map works well to both play in the arena, and also to play a bit of hide and seek. This map is your typical map with 2 forts (one for each team) and an arena in the middle. The twist is that this is map is set in space! So the arena in the middle is reduced to a few invisible blocks that you will need to parkour your way around them. If you don’t want to take the fight to the opposing team though, you can also bunker in your own fort and shoot your enemies from there, as you will have access to a lot of ranged weapons! We love to see people using the tools they have and some themes to create things we couldn’t have imagined, and this map is a good sample of that! If you’re a wrestling fan, you’re going to like this map, as this map is modeled as your typical wrestling arena. And to give more of that wrestling feeling, this map has no weapons! You’ll have to fight with your fists and that makes it more exciting. Defend your homeland. Save the world. Launch your projectiles and protect your realm! The ultimate spatial test for your 3D mind! It's a tough job selling ice creams in MonstR land.